Lengthy debates, committee meetings and floor sessions where legislation is passed are what most people envision when they think of a state Legislature. West Virginia’s Legislature is authorized, under the State Constitution, 60 days a year to meet and pass laws necessary to govern our state. Special sessions can be called by the Governor if deemed necessary and interim meetings are held throughout the year, but the visible realm of the Legislature exists in those 60 days. Yet when these two months are up and the media’s attention is drawn elsewhere, the job of a legislator is not finished. West Virginia has a citizens’ legislature, one that is comprised of our neighbors and colleagues, who are compelled to enter a life of public service. Because they serve in a part-time Legislature, lawmakers have other occupations outside of the Capitol. And from bus drivers, farmers and coal miners to attorneys, nurses and insurance agents, lawmakers truly represent the diverse population and personalities of all West Virginians. When lawmakers leave the Capitol to return to their communities and jobs, their commitment to public service does not end. In many ways, it begins over again. Connecting with their constituents is at the heart of a legislator’s job, offering a pleasant break from the strict rules of procedure that govern committee meetings and floor sessions. “You could stay on the road just attending meetings,” said one Senator, who has served in the Senate for 25 years. Attending local governmental meetings, school functions, receptions, and visiting senior centers and the Boys and Girls Club, to mention a few, are a big part of how lawmakers stay involved in their communities and connect on a personal basis with their constituents. According to one of the longest serving members of the House, there are numerous council meetings, boards of education meetings and special issue meetings on a local level that state legislators from the area attend throughout the year. The Delegate views answering constituents’ questions and addressing their problems as the biggest part of a legislator’s job once he/she has left session. “If a person takes the time to stop and talk to me about a problem, I certainly have the time to talk to them. Or if they take the time to write to me I certainly have the time to answer that letter, whether I call or write back. That is just a part of my job,” said the Delegate. Both lawmakers have noticed the changes in the Legislature during their years of service. The advancement of technology and the prevalence of Internet use have allowed people to be connected daily to legislative activities, eliminating many questions about the status of measures. They both see the increased ability for quick communication and information as a positive improvement. But the Senator points out that while it removes frequent inquiries on the status of legislation, it opens new avenues of questions as constituents want to know the reason for a bill’s status. “The [legislative] process is a thorough one, but it is not a quick one,” the Senator said. The public sees some bills pass in a day, such as with the mine safety legislation this year. But under normal legislative circumstances, following rules of procedure would mean at least a week for a bill to pass one chamber, after it has left a committee. Another change the Senator observed is that the public seems to feel more connected to their lawmakers with the increased use of e-mail and the Internet. Legislators are not just the representatives of the districts they serve, but are frequently the only face of government people see. “The public see us as the go-between from them to all governmental agencies,” said the Delegate. Legislators are public figures, a persona they do not leave in the Capitol when session ends and they walk out the doors and down the steps. “You do get approached when you are just out with your family. But it just goes with the job. As the elected representative for our areas, we are the voice for the people of our district, and people want to make sure that voice is echoing their thoughts,” the Delegate noted. When working with constituents, one of the largest misconceptions lawmakers run across is a general lack of understanding of the entire legislative process. Many people, when they come to observe the floor session, are taken aback by the lack of debate on individual bills, not realizing that the serious debate, work and reworking of bills happens in committees, observed the Delegate. “Constituent relations is almost an educational process too,” said the Delegate, a former educator. The year round aspect of a lawmaker’s job is a time of preparation, allowing them a chance to live and experience the problems in the areas they represent, talk with constituents and gain important insight on issues. Then, when the yearly session rolls around, lawmakers have a clear vision of the agenda for their area. The year-long commitment by delegates and senators is not something that is entered into lightly. Many of the lawmakers are drawn to these positions from the love of working with the public on a daily basis. Senate Bill 216 will continue the Women’s Commission through July 1, 2008 unless sooner terminated, continued or reestablished. The Women’s Commission is funded through the West Virginia Department of Health and Human Resources. Senate Bill 244 relates to state-chartered banks’ investment limitations. Unless waived in writing by the commissioner, a state-chartered bank may not invest or otherwise expend more of its capital and surplus calculated at the end of the previous calendar year on permitted activities on an aggregate basis, together with any of its approved financially related products and services than would be allowed for a national bank providing the same services. Senate Bill 270 will make it so after July 1, 2006, when a vacancy occurs among the executive officers of state banking institutions the Banking Commissioner will list all state banking institutions according to each bank’s asset size and then divide the list into three groups so that there is an equal number of banking institutions in each group. The vacancy will then be filled from the appropriate group to ensure that each group has a representative on the board. Senate Bill 370 will add equipment, machinery, implements, vehicles, supplies, crops and livestock used to engage in commercial farming to property that is exempt from taxation in relation to farming equipment and livestock. Senate Bill 454 will remove the Commissioner of Insurance as the attorney in fact for health maintenance organizations (HMO) for service involving process purposes. An attorney in fact is a person who holds power of attorney, and therefore is legally designated to transact business and execute documents on behalf of another person. House Bill 3019 would add two additional programs to the current number of community volunteer enrichment programs in public schools. The added programs would be the West Virginia Remembers Program, for veterans to speak in the public schools, and the West Virginia Community Arts In Education Program, for artists to share their experiences in the educational setting. The bill also would authorize the state board to establish rules for the new programs’ implementation. House Bill 4089 would provide that on January 1, 2007, registration plates issued to a city or municipality law-enforcement department would include blue lettering on a white background with the word “West Virginia” on top of the plate. The plate would be further designed by the DMV commissioner to include a law enforcement shield together with other insignia or lettering sufficient to identify the motor vehicle as a municipal law enforcement department motor vehicle. Additionally, every municipality would provide the commissioner with a list of law-enforcement vehicles operated by the law-enforcement department of the municipality, and pay a $10 fee for each vehicle submitted by July 1, 2006. House Bill 4023 would raise the state minimum wage from $5.15 per hour to $7.25 per hour. The increase would occur in stages, rising from the current $5.15 per hour to $5.85 per hour on July 1, 2006. By July 1, 2007, minimum wage would increase to $6.55 per hour. The final raise to $7.25 per hour would occur on July 1, 2008. The bill also would make it so the state’s minimum wage would increase in accordance with federal legislation. House Bill 4437 would authorize the West Virginia Department of Agriculture emergency response vehicles to utilize red flashing warning lights. The emergency response vehicles would be designated by the Commissioner of the Department of Agriculture. House Bill 4444 would allow ginseng to be grown, cultivated and harvested on West Virginia public land when land grant university researchers are performing research or demonstration projects regarding the growing, cultivating or harvesting of ginseng. House Bill 4456 would remove limitations on beaver trappings. Previous limitations included the number of traps, the location of traps, and would allow for the disturbance of structures constructed by beavers when trapping. House Bill 4472 relates to family court jurisdiction in all proceedings that concern grandparent visitation to children who are minors. The family court would have the power to grant reasonable visitation to a grandparent upon a finding that visitation would be in the best interest of the child and would not substantially interfere with the parent-child relationship. Additionally, a family court would be able to terminate grandparent visitation if it is proven that a grandparent has violated the terms and conditions of the order of visitation. House Bill 4487 would allow one individual, who is at least 16 years old, to be in a vehicle to assist a hunter with a Class Q permit. A Class Q permit is a special statewide hunting permit allowing certain sportmen to hunt all legal species of game during the designated hunting seasons from a motor vehicle. The individual assisting the permittee would not be allowed to hunt with a firearm, bow or crossbow while assisting the person with the Class Q permit. House Bill 4679 relates to qualified gift annuities. The law would do the following: exempt charitable gift annuities from insurance commission regulation; require that organizations, when entering into an agreement for a qualified charitable gift annuity, disclose to the donor in writing in the annuity agreement that a qualified charitable gift annuity is not insurance under the laws of this state; and, to set forth penalties for failure to provide the required notifications. Senate Bill 10 would allow a credit against a taxpayer’s tax liability for contributions to a community foundation with limitations on credits. This measure relates to personal income and corporation net income tax credits. Senate Bill 18 would add the children and spouses of parole and probations officers killed in the line of duty to the individuals who can receive tuition and fee waivers at state institutions of higher education. Senate Bill 219 would change the expiration for level one instructional permits and level two driver’s licenses. The bill would make level one permits and level two driver’s licenses valid until 30 days after the applicant turns 18 years old. The measure also prohibits the use of wireless communication devices, including cell phones, by a holder of a level one instructional permit or a level two intermediate driver’s license who is under the age of 18. This provision would only be enforced as a secondary violation and does not apply to those minors who are using the wireless communication device to contact a 9-1-1 system. Senate Bill 251 would create the Beckley-Raleigh County Building Code Authority, which would oversee the state building code for the city of Beckley and Raleigh County. The authority would be equally supported by the Raleigh County Commission and the city of Beckley. The measure also would require Raleigh County and the city of Beckley to provide one half of the funds necessary to maintain the functions of the authority. Senate Bill 265 would add to the West Virginia Veterans Memorial Monument the names of all West Virginians who died and may die while serving the United States in the Bosnia, Kosovo, Afghanistan or Iraq conflicts. Senate Bill 489 would, upon written request of a political subdivision, authorize the State Treasurer to provide services of his or her office to a political subdivision and charge the subdivision for those provided services. Senate Bill 496 would allow the transport of wildlife outside of the state for residents and nonresident who have legally killed, taken or capture game. If an individual does not legally kill, take or capture wildlife, he or she would be guilty of a misdemeanor and, if convicted, be fined between $20 and $300 and imprisoned in jail between 10 and 60 days. Senate Bill 575 would grant the West Virginia Contractor Licensing Board the authority to restrict a licensee’s ability to work until he or she has satisfied an adverse judgment in favor of a consumer ordered by a magistrate court, circuit court or arbitration board. Senate Bill 582 would require an income tax return preparer, who has filed more than 100 personal income tax returns for any taxable year that began after January 1, 2005, and he or she prepares one or more personal tax returns using a tax preparation software for a pervious taxable year, to file all unamended personal income tax returns electronically. A tax preparer would not have to follow this measure if, for the previous taxable year, he or she prepared less than 25 personal income tax returns. In addition, electronic filing would not be required if the returns that were not required to be filed for taxable years beginning before January 1, 2006, returns for prior taxable years beginning before that date or amended returns for any taxable year. Senate Bill 581 would amend the definition of “person” in relation to the motor fuel excise tax to include responsible persons. Specifically, the amended definition would include any estate, guardian, executor, administrator, limited partnership, copartnership, organization, and any officer, employee or member of any of the listed terms who, as an officer, employee or member is under duty to perform or is responsible for the performance of an act prescribed by the provisions of the measure. Senate Bill 591 would authorize the Tax Division to collect the cost of federal refund offset fees from a tax debtor. The measure also would create the Tax Offset Fee Administration Fund, which would be a special revolving fund within the State Treasury. Senate Bill 598 would delete provisions that allowed for the distribution of accumulated contributions to the State Teacher Retirement System to a contributor with less than five years of service, who quits service or ceases to be a member, without their consent. The measure also would correct certain code references. Senate Bill 604 would allow a state trooper who retires on a disability pension for an injury he or she sustained while in the line of duty to continue to receive a disability pension after age 55 instead of having the pension changed to a regular retirement pension. Senate Bill 605 would allow applicants registering a vehicle or motorboat with the Division of Motor Vehicles to show the current year’s personal property tax receipt in addition to the previous calendar year’s receipt. This would eliminate the requirement that an applicant choosing to renew for two years show the tax receipts for the previous two years and allow the Division to accept verification of payment of personal property taxes by electronic means. Senate Bill 751 would increase the pay of National Guard members to $100 dollars per day while he or she is in active service of the state. Currently, members of the National Guard are paid $75 a day. Senate Bill 775 would allow a county commission to establish the annual salaries of the county commissioners, sheriff, circuit clerk, county clerk, assessor and prosecuting attorney. The measure also would provide additional compensation for an assessor for completing additional statutory duties. Senate Bill 780 would prohibit expiration dates on gift certificates of less than three years with certain exceptions and limit imposition of various fees and charges that reduce the value of a gift certificate. Senate Bill 789 would allow day report officers to arrest people charged with an offense or a violation of their supervision who surrender themselves to the officer. The bills also would allow the arrest of individuals already under supervision for certain violations committed in the officer’s presence. Senate Bill 792 would merge Fairmont State Community and Technical College with Fairmont State University and rename the Community and Technical College of Shepherd to Blue Ridge Community and Technical College. Lawmakers have adapted to the changing times, utilizing available technology to better connect with their home districts. 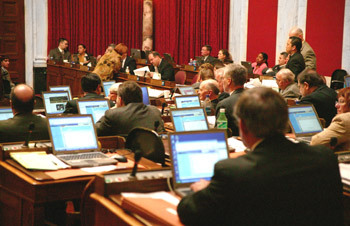 House of Delegates members are shown here, in the House Chamber, using laptop computers to access legislation and communicate with their constituents.